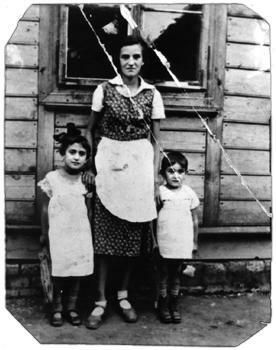 Holocaust Survivors: Photo Gallery - "Three Sisters"
Malka, Hannah and Divorah were sisters to Eva Galler. Malka and Divorah used to entertain guests by singing popular songs. Hannah jumped with Eva Galler from the death train but did not survive. The sisters were standing outside of the Vogel house in Oleszyce, Poland.